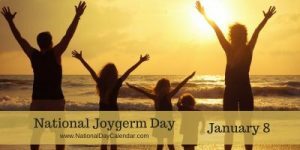 It’s Joy Germ Day! Based on the old concept that happiness is contagious, it promotes the idea that we should try to spread a little around. I would support that idea. 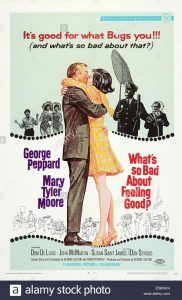 Even longer ago, back in 1968, I remember a movie called What’s so bad about Feeling Good? starring Mary Tyler Moore and George Peppard and a toucan. In the movie the toucan brought a virus from it’s jungle that infected people with feeling good, happiness, and kindness. As that spread around NYC, the government tried to stop it because, although we can understand why sales of alcohol, tobacco and drugs go down, for some reason, the stock exchange and other businesses seem threatened. The vaccine is found and put in the drinking water, and 90% of people go back to feeling grumpy (10% seem to have been immune and were only responding to everyone else being nice). The climax of the film is saving the toucan. 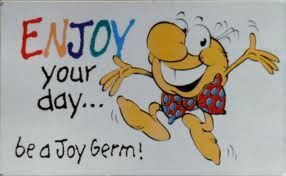 I can’t help thinking of that movie every time joy germ day rolls around each January 8th. I guess we’d all like to be in the 10% who don’t get our happiness from an infection (or pill bottle) but from living in a lovely world. The concept of joy as something external (that we can make others take) is seductive, however we can be nice to each other and make happiness easier for those around us. It’s also bubble bath day- which is harder to share, but still can be fun! This year the CTCW theme will be Joy, which makes this especially appropriate to note this year.